Anthony Joshua, now the face of the heavyweight division, persevered through some very difficult moments but retained his world title -- and won a vacant belt to boot. He did it by knocking out former longtime world champion Wladimir Klitschko in the 11th round of an epic slugfest on Saturday night before a British-boxing record crowd of 90,000 at sold-out Wembley Stadium. The fifth round was wild. Joshua hurt Klitschko and pounced, landing several shots, including a hard left hook, as he knocked him down. Klitschko, his face showing bruises and cut over his left eye, got up quickly and took more incoming shots before turning things around. By the end of the round, he had Joshua in trouble, having landed a powerful left hook that rocked Joshua. Klitschko was going for the knockout and had Joshua backing into the ropes and taking deep breaths as they swung away, with Klitschko landing another left hook. Klitschko picked up in the sixth round where he left off in the fifth, landing an overhand right that deposited Joshua on the canvas, the first time he had been knocked down in his career. Klitschko had Joshua in tremendous trouble as he sagged along the ropes with each incoming punch and looked to hold on. Another right hand bent Joshua over, and he appeared exhausted as the round ended. The pace slowed a bit, as both had poured out energy in the previous rounds, with Joshua going past seven rounds for the first time. 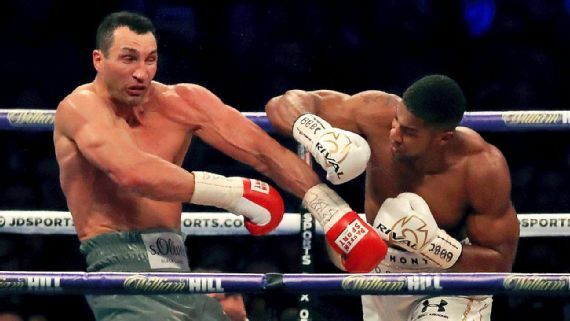 Joshua (19-0, 19 KOs) landed a good hook to Klitschko's head and had him looking to hold on early in the 11th round, but Klitschko (64-5, 54 KOs) quickly recovered. But then Joshua blasted Klitschko with a right uppercut, and he went down hard. Joshua continued to rain punches on Klitschko before he landed a huge left hook that knocked him down again. Klitschko showed heart to make it to his feet, but as Joshua hammered away at him, referee David Fields stepped in to wave it off at the 2:25 mark as the crowd sent a wave of electricity through the packed stadium.